The Uncontrollable Runs faced a familiar foe in their season opener, and it was a doozy. The Runs sent out the best players they had to offer, and after falling down 1-0 and seemingly close to 2-0, the duo of Nicole and Hield stepped up big time. Without their all-star Londo in the lineup, and with Tom easily distracted as usual, it took a strong effort from the rest of the players, in what will go down as a legendary win over a strong opponent. This also included the welcomed addition of Bryant to the team, as he showcased his speed and skills early. 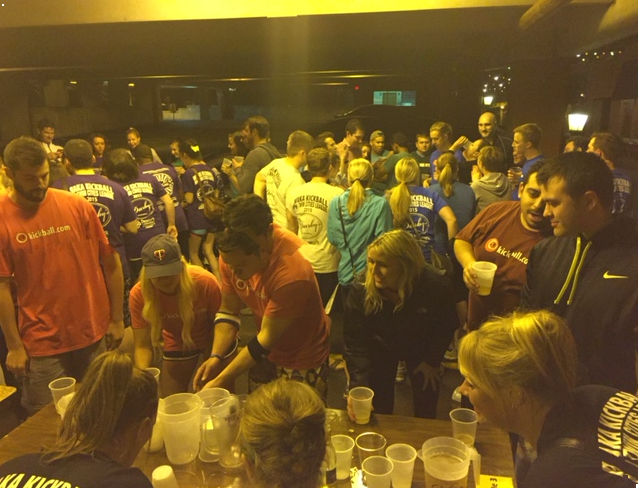 The Uncontrollable Runs beat Pitch Please in flip cup 3-2! In kickball, the Runs also won 7-2 to start the season off strong. Even better than their performance was the turnout at the bar afterward, as all but 3 players made it out for the night. The Runs are already looking like they're in midseason form, and the improved and stronger roster should have many a teams scouts nervous for the upcoming season. Play of the game came from Kelsey as she instinctively knocked the ball down to the ground with 2 outs, distracting the team by pretending to fall over, and then throwing the ball to 2nd base. A truly veteran play.